Microsoft says Fable III will be saving PC gaming a bit later than originally planned. A quick recap: First, Fable was released for the PC as well as the Xbox. Fable II, on the other hand, was a console-exclusive title. 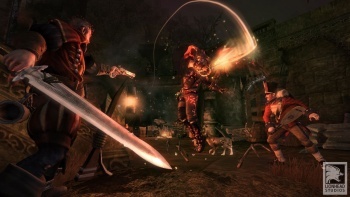 Then, it was revealed that Fable III would be returning the series to the PC. Microsoft pledged that Fable III would mark the return of its unwavering support of PC gaming. Today, Microsoft confirmed to IGN that the PC version of Fable III (and presumably said unwavering support of PC gaming) would be delayed. The Xbox 360 version, however, is still set to be released on October 26th. This appears to be a recent decision, as Lionhead boss Peter Molyneux had previously confirmed that the game would launch simultaneously on Xbox 360 and PC back in June. "The console and PC versions are now on different schedules as we're focusing on building experiences optimized for each platform," said the software giant. "We aren't announcing a ship date for the PC SKU at this time, but expect news soon." So there you have it, folks - you'll have to wait just a little bit longer for Fable III to mark Microsoft's returned commitment to PC gaming. Hopefully it'll be all the better for the wait - maybe they'll let you spawn your Fable III character on PC as the child of your Fable II character on Xbox 360. Hey, that Xbox Live/Games For Windows Live cross-functionality has to be good for something, right?